Louisville, KY (April 8, 2013) – The 2013 Kentucky Farm Bureau (KFB) “Farmer of the Year” application process is now open, and the organization is seeking the Commonwealth’s finest nominees for this prestigious award. 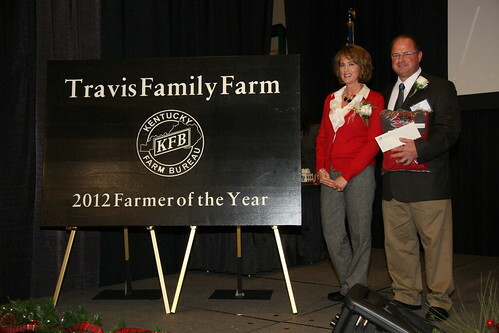 2012's "Farmer of the Year" Scott Travis (right) pictured with his wife, Robbie Travis. KFB initiated a “Farmer of the Year” awards program as a way to recognize its members for their commitment to excellence in agriculture, efficiency in farming practices, sound financial management and outstanding leadership in their county Farm Bureau and other civic organizations. Eligibility and guidelines are included with the application, and can be downloaded at kyfb.com/federation/. All applications must be postmarked by July 1. Entries will be narrowed down to the top three applicants over the summer, and finalists will be announced in mid-August. Judges will visit the three finalists in mid-September to conduct interviews and see their operations in action. The winner will be announced at the organization’s 2013 state annual meeting in Louisville on December 6. KFB’s “Farmer of the Year” will receive $1,000 from Kentucky Farm Bureau Federation and will be presented with a commemorative award during the organization’s annual meeting in December. State finalists will receive $250 from Kentucky Farm Bureau Federation. In addition to the statewide recognition and prizes, KFB’s “Farmer of the Year” winner will represent Kentucky in the Swisher Sweets/Sunbelt Expo Southeastern Farmer of the Year contest, the South’s most prestigious agricultural award, in Moultrie, Georgia, October 14-16, 2014. The state winner will also receive $2,500 from Swisher International, a $500 gift certificate from Southern States Cooperative, the choice of either $1,000 in PhytoGen cottonseed or a $500 donation to a designated charity from Dow AgroSciences, and a Columbia vest from Ivey’s Outdoor and Farm Supply. Kentucky’s winner will compete against nine other state winners for the chance to win a $15,000 award from Swisher International and several other sponsor-based prizes.